Meat Free Monday_Bonkers for Bok Choy! TGIM! It's the start to a new week, new opportunities and new perspectives. 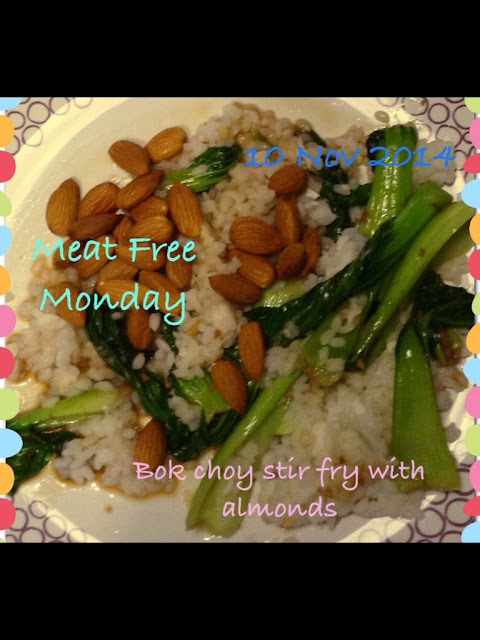 Today's MFM focuses on Bok Choy. Have you ever eaten bok choy? If not, you should definitely try it! I'm probably kind of a weirdo. At least once or twice a day my body craves bok choy. I love it for breakfast in a jiaozi, I love it for lunch with a noodle soup, and I love it for dinner with Thai food, Chinese food or Vietnamese food. I think you'll love the stronger flavor of bok choy in a stir fry versus using broccoli. Plus, bok choy won't leave you bloated like broccoli! My recommendation is to prepare it in a smoothie or vegetable soup first, if you're hesitant to eat it by itself. Step 1: Sautée olive oil, almonds and garlic over low heat. Step 2: Add bok choy and 1/4 cup of water, and 2 tablespoons of soy sauce. Step 3: Serve over rice, couscous, barley, or your grain of choice. Season with salt and pepper to taste. Step 4: Enjoy the dish! Step 5: Repeat every chance you get! I'd like to call your attention to the fact that almonds are a super food; great source of vitamin E, calcium and protein. They also neutralize the effect of a high GI food, like white rice. Any meal is better with almonds.